Let’s be honest – for many of our students, writing in French is such a struggle. As teachers, grading 60-125 essays that are poorly written can be torture. 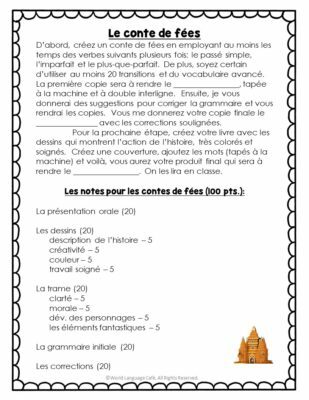 Imagine if you had a French writing process that taught your students to write flowing sentences with correct grammar AND made them proud of their finished product. 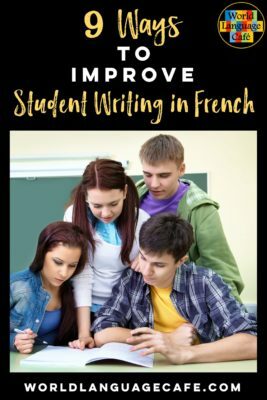 To help make this scenario a reality in your classes, check out 9 ways to improve your students’ French writing skills. Think of how many years you spoke your native language before anyone made you write something down on paper (at least 4-5 years). If students can’t say something, then of course, they won’t be able to write yet because writing is much more complicated than speaking. 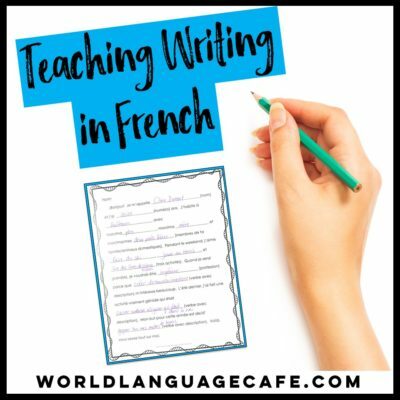 Focus on getting them thinking and speaking in French before introducing writing in any sort of long form. Writing sentences here and there is fine, but avoid assigning compositions until they master basic speaking abilities. At the beginning of the year, I used to ask my French 2 students to present an “All about Me” oral presentation that they would then turn into a composition. Although, this was great in theory, in practice they made so many errors. Now, for many assignments, my students use a template to write their compositions. Check out how this works with a free “All about Me” writing template in my Free Resource Library. If you’re not a member yet, just click subscribe and enter your email to get the password – it’s free. 3. 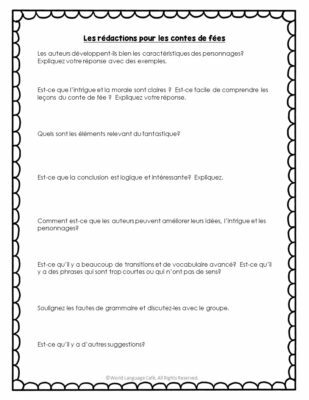 Spark your students’ creativity with engaging French writing assignments. 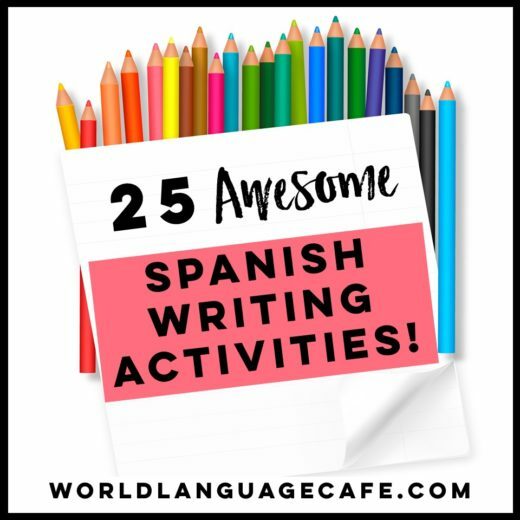 Writing secret Valentine’s, fairy tales, resumes about famous Hispanics, vacation postcards, or social media profiles can really get your students engaged in the writing process. Need more ideas? Check out this list of 25 French Writing Activities. 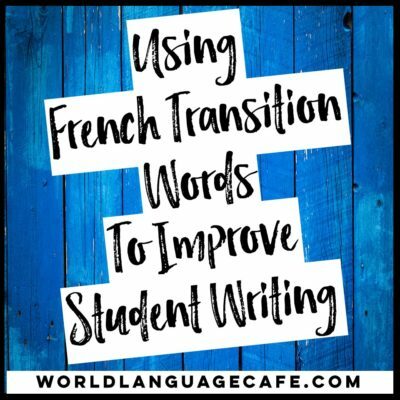 When I was a student, trying to write in French, I used to get frustrated because I knew how to write nice, flowing sentences in English, but didn’t know how to say any of the transition words that I would normally use in French. I was super conscientious, so I would spend time looking up how to say these more advanced words. However, often our students don’t take the time to look up the words, so instead they just leave the short choppy sentences. Don’t know about you, but I can’t stand choppy sentences! 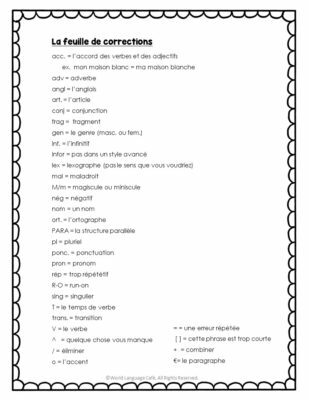 In grad school, I made lists of good transition words to keep as a reference in my notebook, and then eventually, as a teacher, transformed this into a list of 100 French transition words, sorted by level, with sample sentences for each one. My students love these lists!! It’s amazing what peer editing can do. Students like being “the teacher” and making suggestions for other students’ work. 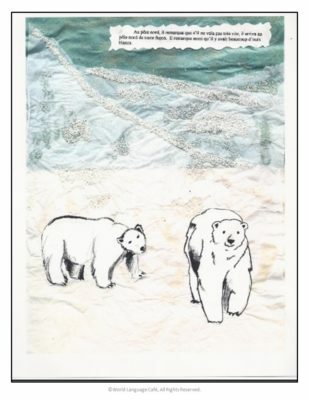 It makes them more aware of their own errors and teaches them how to revise and improve their own work. Students hand in their first and second drafts with the peer edits attached underneath. This will save you some time correcting because they have already corrected some of the error and improved their work. Correct their final copy and this time write what the actual corrections should be on the story (because they weren’t able to figure them out on their own). Hand it back to them. Don’t kill yourself by trying to have your students write all the time. After all, think about how often they’ll be using their French writing skills vs. their speaking skills. Probably 90% speaking and 10% writing, if that! I would much rather have my students produce 1 quality piece of edited and revised writing per quarter than 3 sloppy compositions. Less grading for you and your students will feel more accomplished and successful if they’re producing high quality work. 8. 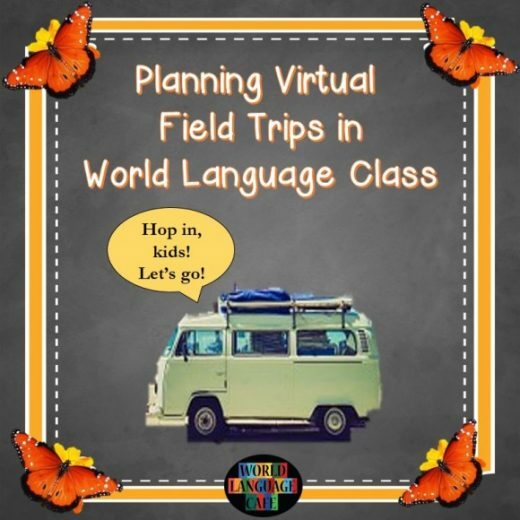 Space out your French writing projects. If you teach several preps, don’t wait until the end of the quarter to assign all your writing projects. Try to space them out throughout the quarter so that you don’t end up with an enormous pile of writing projects to grade all at once. Why not give yourself a break from teaching and use these extra minutes to get ahead on teacher prep/other grading so that when your students turn in their huge stack of essays, you’ll have time to grade them. Also, it will give your students a chance to ask you or their peers questions during the writing process. 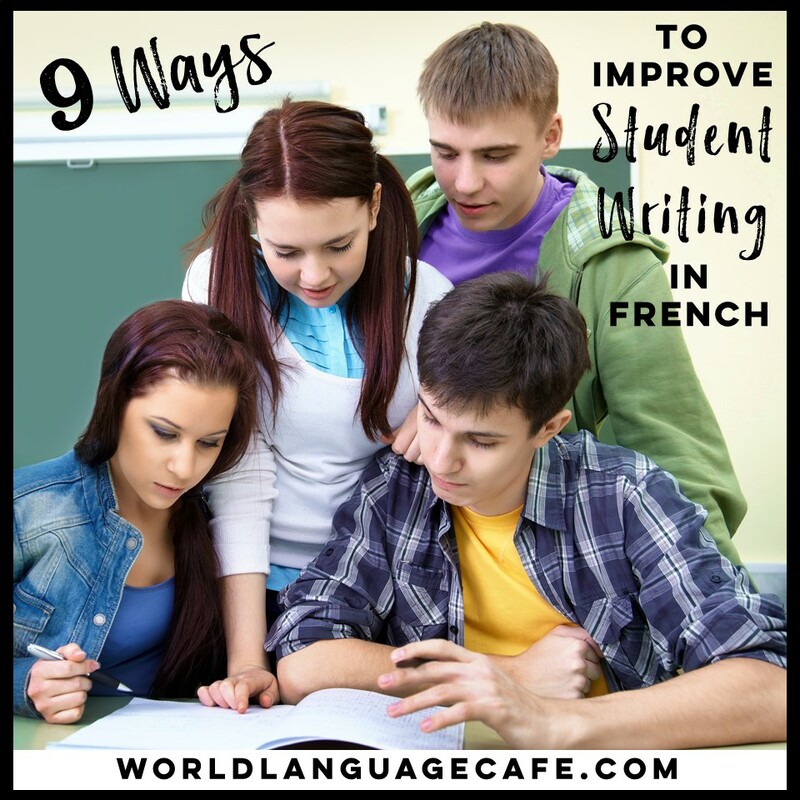 Hope these 9 tips dramatically improve French writing in your classroom as much as they did in mine. Remember to get your free peer edits, correction symbols, sample transition words, and All about Me project in the Free Resource Library. If you have other ideas and suggestions for writing in French, please share in the comments.